Hello, and good morning to you! There's a lot of excitement these days, as we get ready for a new release at Peachy Keen Stamps. Ya wanna know what else is exciting? Our family at Peachy Keen has very graciously donated the stamp set that I'm previewing to one lucky person who leaves a comment on my blog post today. A winner will be announced tomorrow here, and on the Peachy Keen Stamps Blog, so your time is limited to get your name in the hat to win this amazing stamp set before it's even released!! How cool is that?!!!!! If you want a chance at winning, all you need to do is 1) Be a follower. 2) Leave a comment on this post. 3) Be sure to leave me contact information so that I can get in touch with you when you win. This is IMPORTANT, because if I can't find your contact info, I'll have no choice but to choose another winner. Here's my sneak peek, and I can't wait to share the rest with you!!! Tomorrow is the big day! We're going to be blog hopping, showcasing this new release, and you will have your first chance to place your orders with some amazing sales incentives. Here are some of the exciting details about what you can win!!! A Peachy Keen Stamps Gift Certificate for $50.00!! With 2 packages of matching nestabling! The winner's choice of one EK Success Punch on our site! There will be a PROMO PACKAGE TO RECEIVE 25% OFF the ENTIRE RELEASE. Now, if this isn't enough to get YOU excited about this release, with all these free stamps, prizes, and whatnot, I have one more little tidbit to entice you. 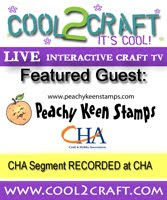 How about the chance to win a $25.00 gift certificate to Peachy Keen Stamps to spend any way you'd like? How about a BUNCH of chances to win a $25.00 gift certificate? When you hop along with us tomorrow, be sure to leave a comment on each designer's blog, because that's how you'll be entered for a chance to win, and you've got until Monday to do it!!!! Thanks for taking this little sneak peek with us today! See you tomorrow for some hop, hop, hoppin'!!! Have a beautiful day and happy stamping! I am so excited for the new PK release. I received a gift cert. to PKS for Mother's Day so this release was perfect timing. Thanks for the chance to win. Can't wait to see the rest of the card tomorrow. To cute. Looks so cute! Can't wait to see the rest of the image. Oh my, this is so cute!!! I can't wait to see your whole card.. Looking good so far, I live out in the country and I have plenty of cute ideas for various cards for the many little old farmer neighbors that I would love to make cards for, they are always so helpful in teaching this new country girl how to do things, so to win this (even tho it's a peek, I know it will be great) would be super exciting! Thanks for the chance! Such a fun sneak peek! Can't wait to see the rest tomorrow. I love PK sneak peeks - can hardly wait to see what you created in its entirety. The stamps at PK are great, just as your coloring is amazing! I can't wait to see what you have done to the rest of your card! I'm soooo going broke after this release!! lol Sooo cute!! Cute sneak peak! Cant wait for the hop tomorrow!! Thanks for the sneak peak--can't wait to see all of the rest! I guess you've been unofficially deemed the Hillbilly Holler ambassador. Can't wait to see the whole thing. oh my gosh! Thanks for the heads up on all the bonus prizes! I am super excited to see the rest of the sneek peek! Great coloring. Love how you did the dog hair. Can't wait to see the whole thing, Lorie!! I know it's fabulous! Can't wait to see the rest of that image. I can't wait to see the rest of this image. The dog kinda reminds me of what my beagle does. Can't wait to see the rest of this tomorrow. How cute, can't wait to see it all tomorrow! OMG...that little dog is so cute! Can't wait for tomorrow. Thanks for the sneak peak and the chance to win!! It appears that Kathy is releasing another great set of stamps. Thanks for the chance to win. I can't wait to see all the rest of the new release!! Woot!! Cute sneak peak...I really love how you have colored the image, cant wait to see the whole card. I am currently researching to purchase a set of copic pens...I want to try coloring myself...Im sure it wont be as cute as the job you have done. Will be back tomorrow, since I'm dying to see the rest of this! Bet it's gonna be fabulous. Looks like there's some howling going on. Too cute! Interesting sneak peek! I am a follower. Aww too cute. Can't wait to see whats to come. Very cute peak! Can't wait for tomorrow!! Sneak peeks are such fun... but not as fun as seeing the whole thing. I can't wait! Heehee looks like their taking a nap out in the front porch.... maybe. Can't wait to see your card and the big PKS reveal.